Extremely high and constantly increasing tax rates on Cigarettes provide a profitable opportunity for tax evasion by illegal trade in both international smuggled and domestic tax evaded cigarettes. 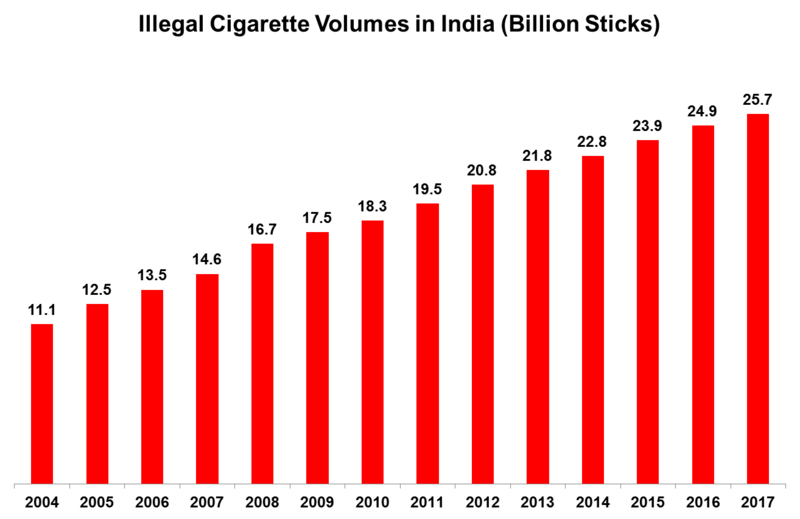 The escalating and unprecedented tax burden on Legal Cigarettes has trebled since 2011-12 as a consequence of successive increases in taxation. 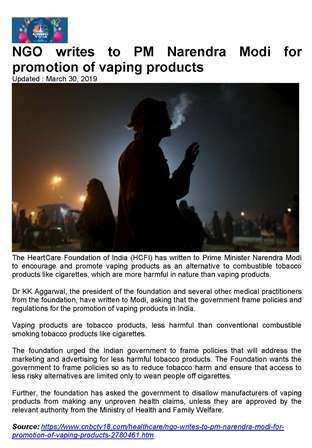 Further, extreme regulations such as Pictorial Health Warnings provide further encouragement to the illegal cigarette trade in India, as illegal cigarettes do not comply with tobacco control regulation of the Government. 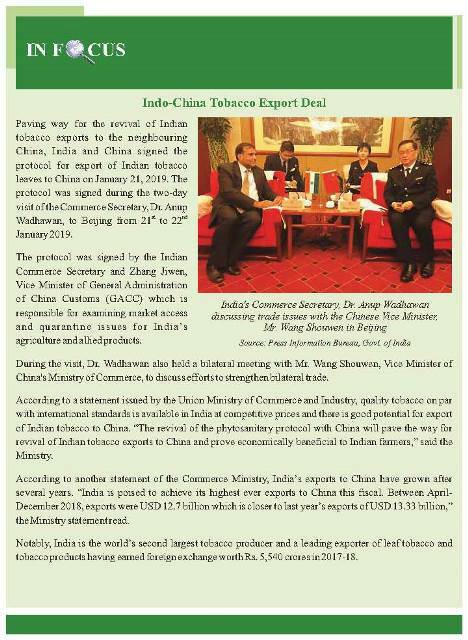 According to Euromonitor International, a renowned global research organization, illegal cigarettes in India have more than doubled since 2005, making India the 4th largest illegal cigarette market in the world and clearly a preferred destination for international cigarette smugglers. 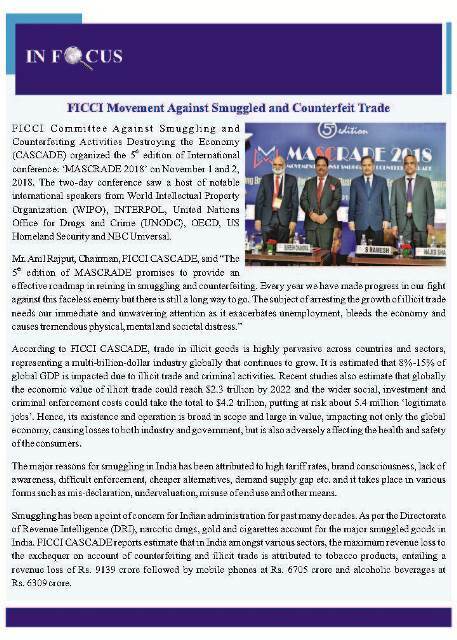 The availability of International Smuggled Cigarettes has spread all over the country as retailers benefit enormously by pushing sales of these cigarettes due to higher trade margins as these Cigarettes are offered to retailers at extremely low prices compared to Indian manufacture. Illegal cigarettes are sold cheap due to tax evasion affording a huge arbitrage opportunity. Availability of these products spreads across urban as well as rural markets – in metros they are almost universally available. Smuggled Cigarettes are particularly popular among youth as they carry International Brand names and are cheaper than Indian brands. These smuggled cigarettes also do not carry the mandated pictorial warnings. Another aspect of illegal trade in cigarettes is the large and growing segment of low price domestic tax-evaded cigarettes. Unscrupulous manufacturers, lured by the huge arbitrage opportunity, have set up units by exploiting the provisions in the I(D&R) Act, 1951. Products from these units are available in the market at Re.1 per stick (filter cigarette) which is even lower than the applicable tax rates, only possible if taxes are evaded. Constant increase in tax rates has rendered the legal industry unable to counter the growing illegal Re.1 filter cigarettes. This has put the legal cigarette industry at a severe disadvantage while enabling a much higher arbitrage opportunity to the illegal operators. Illegal cigarettes are readily available at marketplaces, paan shops and hawkers’ stalls across the country. Indeed, cigarette sellers prefer to stock these brands as their low prices ensure higher trade margins. 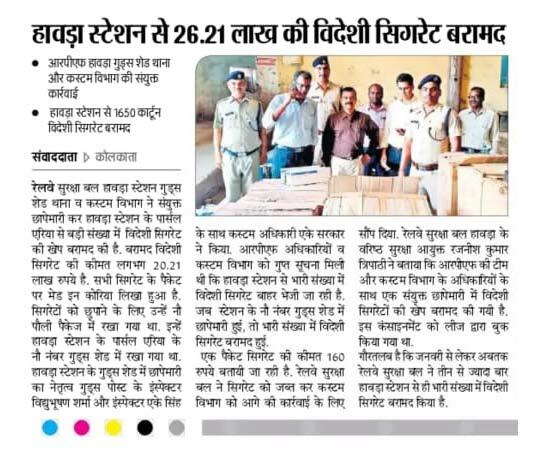 Illegal trade seriously undermines the social objectives of tobacco control through the availability of tobacco products at extremely low prices which are also of suspect quality, manufactured under unhygienic conditions. By not adhering to Regulations such as the Pictorial warnings, illegal cigarettes undermine the tobacco control policies of the Government and deliberately create the impression that these products are safer. In the absence of mandated warnings and other statutory requirements on packaging Illegal cigarettes are easily identifiable at selling outlets. The illegal trade in cigarettes in India, like rest of the world, is controlled by anti-social, criminal elements in society. Growth in illegal trade implies availability of more funds with these elements to execute their unlawful activities against society. Internationally, it has been determined, for example recently by the US Department of Homeland Security, that profits from cigarette smuggling have been used to fund criminal and terrorist activities posing a huge threat to National Security. 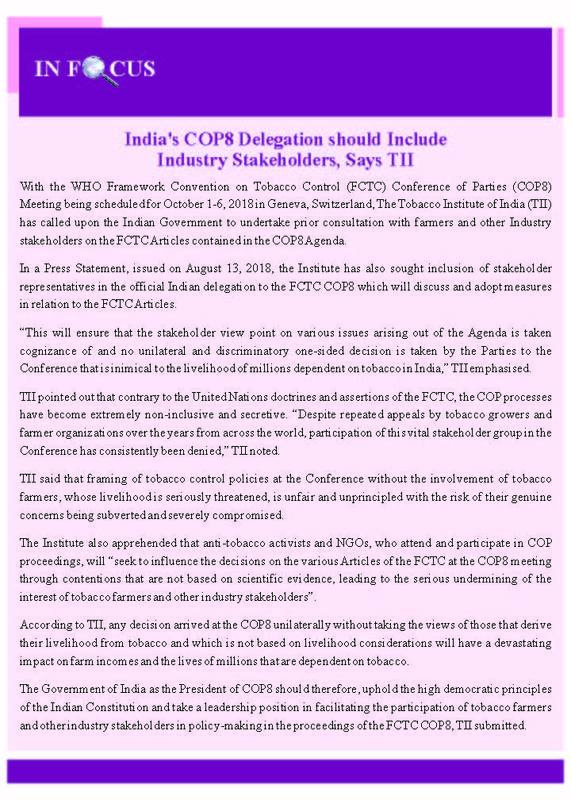 Another undesirable outcome of the growth of illegal trade is that it would further undermine the tobacco control policies of the government and affects farmer earnings. 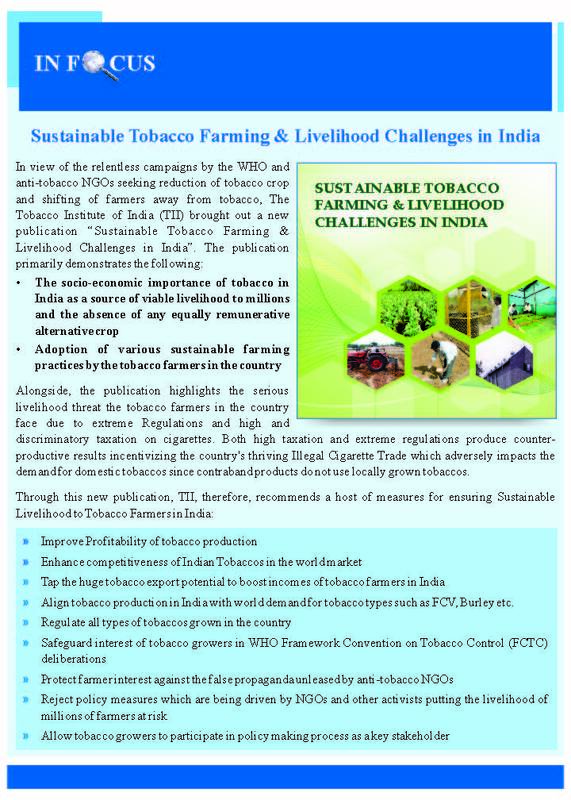 Since contraband products do not use local tobaccos any increase in illegal trade will also impact the livelihood of tobacco farmers in the country as demand for domestic tobaccos will reduce further. 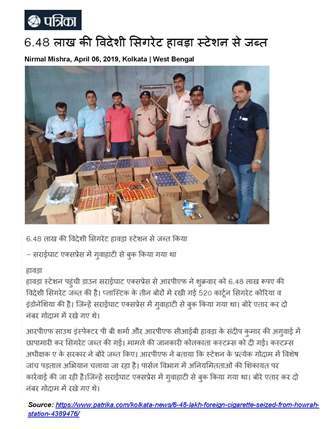 In recent months, the incidence of seizures of smuggled cigarettes by the Enforcement Agencies, as reported in the Media, has seen a sharp spurt in different parts of the country. However, the reported seizures are only the tip of the iceberg of a much larger operation, as for every seizure dozens of consignments escape any surveillance. 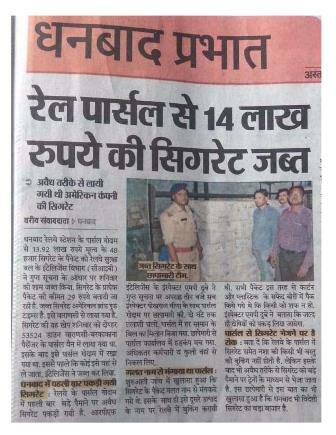 The trade in illegal cigarettes in India is growing rapidly. 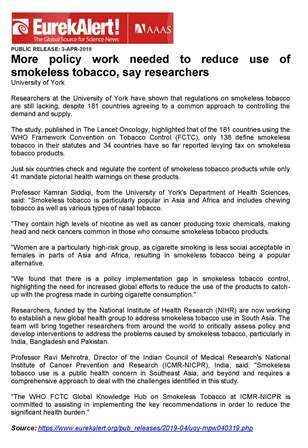 This clearly demonstrates that extreme regulations and discriminatory taxation policy against cigarettes does not decrease overall tobacco consumption. It simply catalyzes the growth of the illegal cigarette trade, and compels people to switch to cheaper illegal cigarettes or low quality, cheaper forms of tobacco consumption. 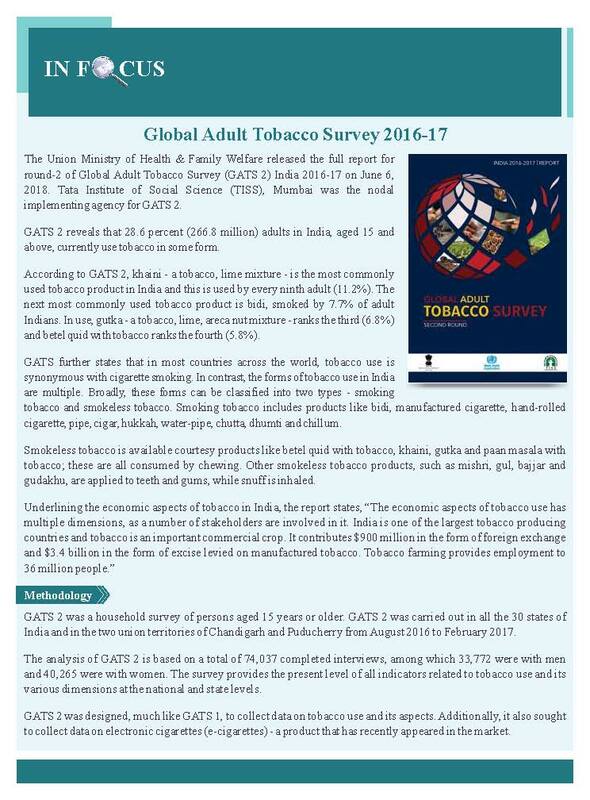 Since the enforcement alone cannot fully address the menace of the large and growing illegal cigarette trade in the country, there is therefore, an urgent need for the Government to make systemic policy intervention with regard to high taxation and excessive regulation in order to adequately deal with the huge Illegal Trade problem.